In this video we will be learning how to declare variables in word problems. The length of a rectangle is 5 units longer than the width. If the perimeter is 22 units, how long is the width? Let’s go over declaring variables. When we have word problems, we may start writing down equations based on the given then try to solve it. But if we lost track of what the variables are, it’s highly possible to get an incorrect answer. Let equal a number of something. Or let equal the width of a shape. A book store charges for the first book and for each additional book. 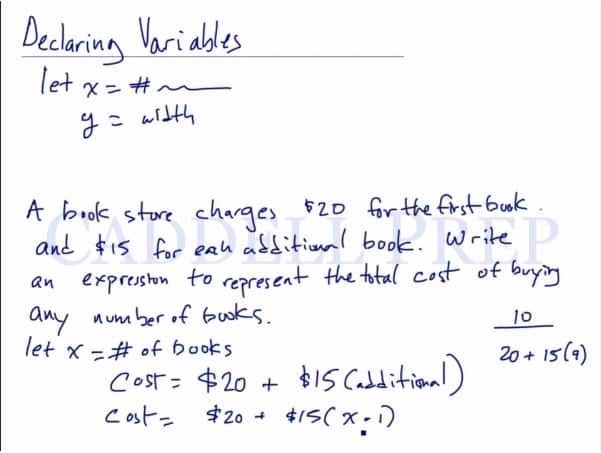 Write an expression to represent the total cost of buying any number of books. Let’s start with declaring the variables. Now we need to know the total cost based on the information given. Let’s use in this equation. is the number of additional books. So we subtract the first book from cost . We bought books. The cost is going to be additional. It’s not because the first book is valued at . The length of a rectangle is units longer than the width. If the perimeter is units, how long is the width? Now, let’s draw a rectangle. Label the two as “w” for width and label the length as “ “. Since we already labeled the rectangle, it’ll be easier. Then subtract to both sides of the equation. Now, let’s go back to the problem and substitute the value of .